Watch the NTPC Green Bond Market Open video. FTSE Russell's FTSE4Good opens London market. Green capital markets across asset classes. London Stock Exchange Group is committed to developing the most climate-aligned investment environment in the world. It will be a long journey. We are making progress. Certified green projects can give sovereigns, banks and corporates privileged access to London’s deep pool of climate-aligned capital through London Stock Exchange’s dedicated green bond segments. As world leading market infrastructure experts, we at London Stock Exchange Group are ideally placed at the heart of global capital markets to integrate sustainable and green solutions deep into both investment and capital raising. Across our diversified business model we have been supporting investors and issuers in the transition to a low-carbon and sustainable economy for over a decade, developing innovative products and services in close collaboration with clients and thought leaders. London Stock Exchange Group’s comprehensive sustainable finance offering is focused on two key areas: green financing for issuers (both debt and equity); and information services - including indices and analytics – that enable investors to incorporate climate and sustainability considerations into their investment process. In June 2015, London Stock Exchange launched its dedicated green bond segments, establishing strict admission criteria aligned with ICMA’s Green Bonds Principles. London Stock Exchange is now home to a diversified range of green bonds issued in seven different currencies by supranational institutions, local governments and municipalities as well as corporates. Our markets are also home to a broad portfolio of environmental solution funds, including renewable investment funds, green and sustainable exchange traded funds (ETFs) and corporates whose business models encompass alternative fuels, renewable energy equipment and alternative electricity. Finally, our global benchmark business, FTSE Russell, serves institutional and retail investors globally, with approximately $15 trillion being benchmarked to its indices. Through its Green Revenues and Environmental, Social and Governance (ESG) data models the investment community can access the tools - data, analytics and benchmarks – they need to shift capital allocations towards a greener and more sustainable economy. Discover FTSE Russell’s solutions for investors seeking to decarbonise their portfolio or gain exposure to the green economy. FTSE Russell assists investors in managing their exposure to ESG risks, meeting mandated stewardship requirements and implementing ESG investment strategies. 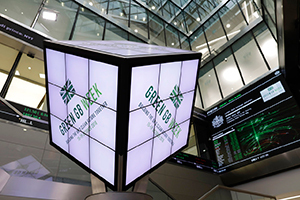 Why London Stock Exchange is the leading venue for green instruments from across the globe. London is the western hub for Renminbi Green Bonds. London Stock Exchange waives admission fees for Retail Charity Bonds. London is the largest global centre for Green Masala Bonds. World bank issues Masala and Dim-Sum Bonds on EuroMOT, Borsa Italiana. Elite Connect is London Stock Exchange Group’s Investor Relations service that aims to reduce the environmental impact of investor meetings. We team up with organizations that are shaping the space of sustainable finance globally. Exchange Traded Funds tracking clean energy indices help investors with their passive low-carbon portfolio management strategies. London Stock Exchange Group has joined the UN Sustainable Stock Exchanges’ campaign to close the ESG disclosure gap. See our contribution to recent public consultations on sustainability disclosure.